While the primary election feels like a distant memory, the general election is less than six weeks away! Because Board of Education races are non-partisan, there are still competitive races for all four seats on the ballot (Districts 1, 3, 5, and At-Large) this year. You’ve seen our endorsements for Board of Education, and now here’s your chance to meet the candidates. This page will be updated throughout the fall with debates and candidate events as we hear about them. 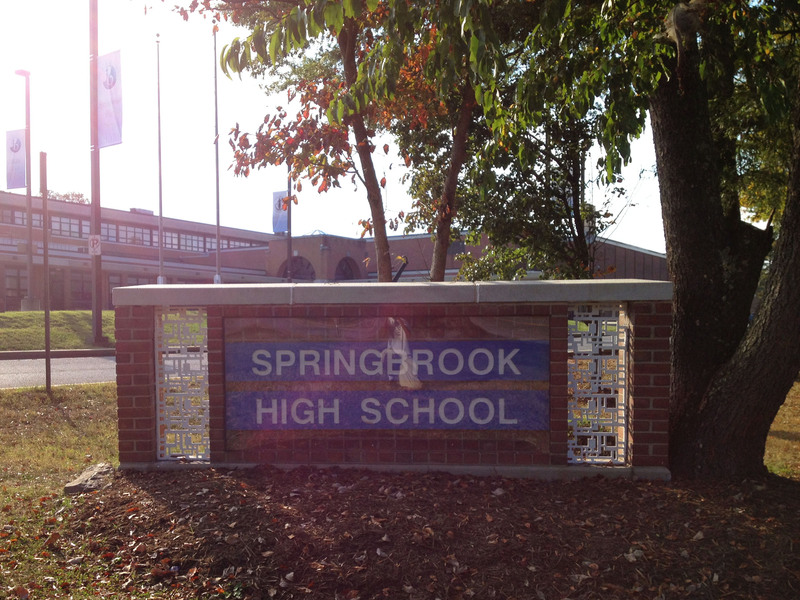 Don’t forget: Election Day is Tuesday, November 4 from 7am to 8pm. Early voting runs from October 23 through October 30 at polling places around Montgomery County. And you’ve got until October 14 to register to vote. Wednesday, October 15th: 7:00 – 8:30 p.m.
River Falls Club House 7915 Horseshoe Lane, Potomac, MD. Monday, September 29: The League of Women Voters of Montgomery County and Montgomery County Council of Parent-Teacher Associations are hosting a candidate forum with both incumbents and challengers. The event starts at 6:30pm at the Carver Educational Services Center, located at 850 Hungerford Drive in Rockville. Tuesday, September 30: The Montgomery County Taxpayers League, Montgomery County Civic Federation, and Parents Coalition of Montgomery County host a forum for challengers only. That event starts at 7:00pm at the Rockville Library, located at 21 Maryland Avenue in Rockville. Sponsored by Start School Later, Inc.
One Montgomery announces candidate endorsements for 2014 primary elections in Montgomery County, Maryland. A recent report on school performance by Montgomery County’s Office of Legislative Oversight shows that the achievement gap in county schools has grown in recent years, particularly within the Northeast and Downcounty consortia. Because geographical boundaries almost always determine school assignments, school quality is closely tied to neighborhood stability and the health of our local economy. As a result, Montgomery County Public Schools needs to dedicate adequate staffing and programs for high-needs schools to ensure high-performing schools in all parts of the county. 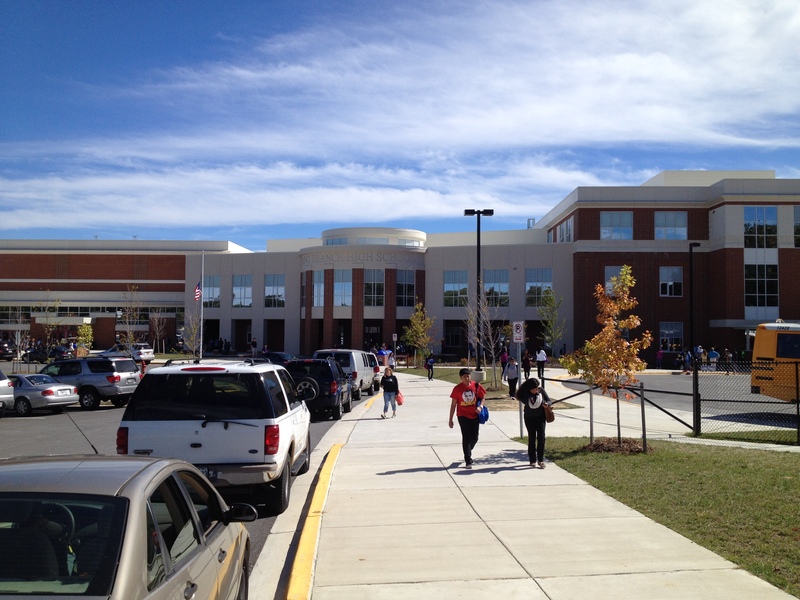 One Montgomery has produced a set of recommendations for ways MCPS can do that, using feedback from community workshops and education forums it has organized or participated in over the past year. Candidates endorsed by One Montgomery have records of community and political activism that prove their commitment to closing the achievement gap. Legislative and council endorsements were made based on candidate questionnaires, interviews, and public statements. For school board endorsements, One Montgomery teamed with a Takoma Park education group to interview candidates. See our sample ballot below. Click here or on the ballot for a printable copy. 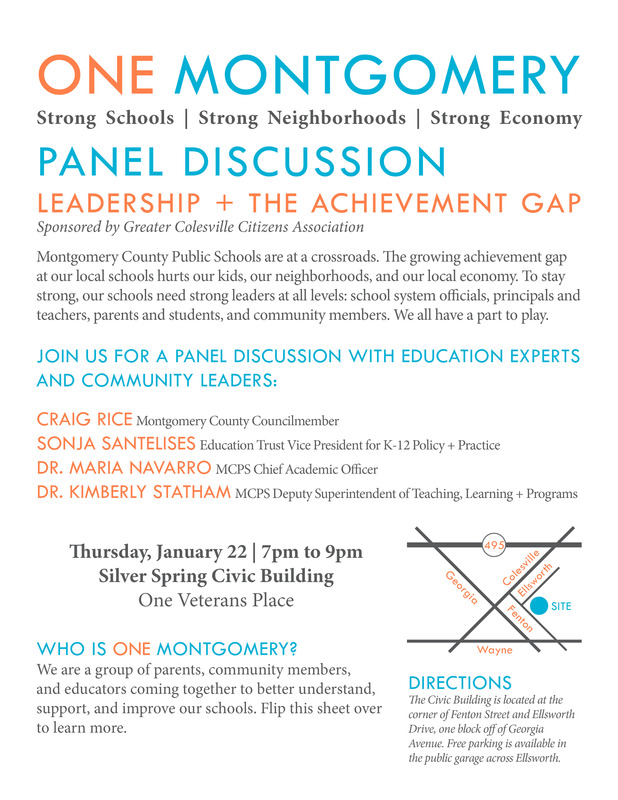 Next week, hear from education expert Rick Kahlenberg on how to close the achievement gap in Montgomery County Public Schools and discuss the performance of East County high schools at two meetings around the area. On Monday, Kahlenberg will speak at the Montgomery County Civic Federation’s monthly meeting, Kahlenberg recently wrote an op-ed for the Washington Post arguing that integrated, diverse schools are the best way to improve the performance of all students. He’ll be speaking alongside Dr. Elaine Bonner-Tompkins of the county’s Office of Legislative Oversight, who wrote a newly-released report about the achievement gap and growing segregation in Montgomery County high schools, and at-large County Councilmember Hans Riemer. The meeting will be held this Monday at 7:45pm in the first-floor auditorium of the Council Office Building, located at 100 Maryland Avenue in Rockville. For more information, visit the Civic Federation’s website. And on Wednesday, the East County Citizens Advisory Board will host a presentation about Office of Legislative Oversight report, focusing on changing demographics and drops in student performance in East County schools. The Board is made up of local community members who are appointed by County Executive Ike Leggett to represent and speak for East County residents. That meeting will be at 7:00pm at the East County Regional Services Center, located at 3300 Briggs Chaney Road in Silver Spring. We hope to see you at one of the meetings this week! It’s great to see that community leaders are interested in talking about the issues facing East County schools and how we can all work together to make them stronger. A half-century of research, however, suggests that pouring extra funds into high-poverty schools is not the most important thing policymakers can do for poor kids. Giving them access to high-quality middle-class schools is far more effective. Money matters in education, but other things matter more. The “resources” a school provides include not only funds but also academically engaged peers who encourage achievement among classmates, a cadre of parents who volunteer in class and know how to pull the levers of power when things go wrong and teachers who have high expectations for students. 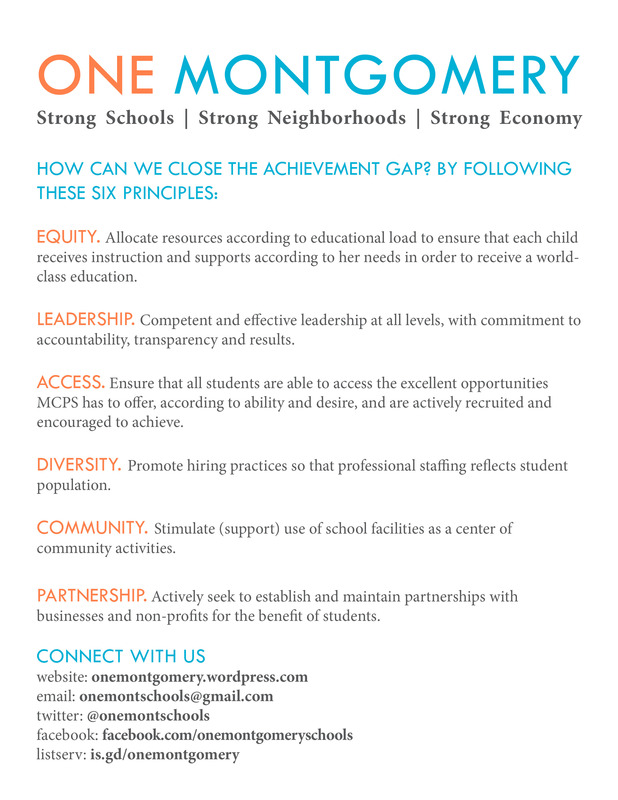 All of these ingredients for success are much more likely to be found in schools with a majority of middle-class students than in high-poverty schools. Kahlenberg, who lives in Bethesda and whose children attend public schools here, cites past research about MCPS that says low-income students do better in low-poverty schools than in high-poverty schools. He also notes that despite efforts here and elsewhere to improve schools were most students are disadvantaged, socioeconomically diverse schools are 22 times more likely to perform better. Middle-class parents understandably do not want to send their children to schools with overwhelming poverty, but Columbia University researchers Allison Roda and Amy Stuart Wells have found that many white, advantaged parents see racial and ethnic diversity as a plus in preparing children for a 21st-century workforce. Schools that offer bilingual Spanish and English programs are particularly popular and highlight the ways in which diversity bolsters learning, as native Spanish speakers can help English speakers learn a new language, and vice versa. You can read Kahlenberg’s full article in the Washington Post. 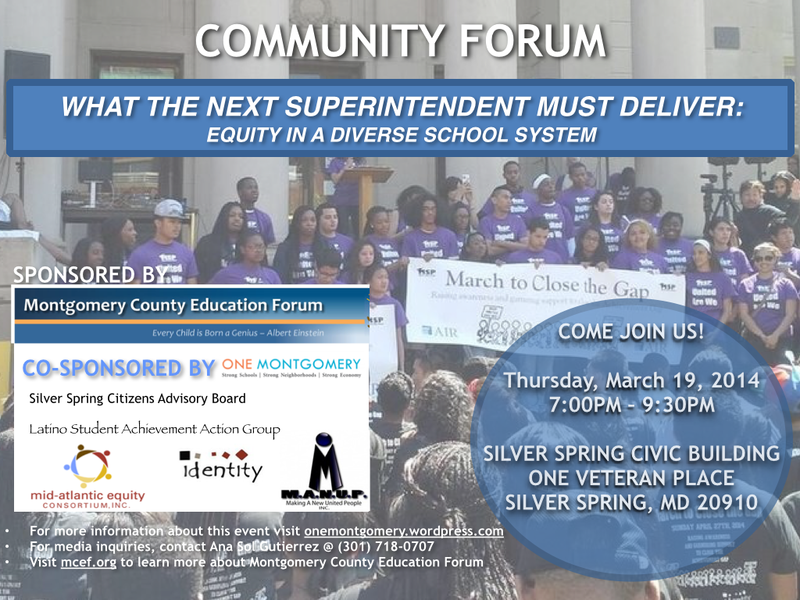 Next month, he will give a talk about how to close the achievement gap along with Elaine Bonner-Tompkins, the county researcher who recently released a report about segregation and academic performance in MCPS. The meeting, hosted by the Montgomery County Civic Federation, will be Monday, May 12 at 7:45pm in the Council Office Building’s first floor auditorium, located at 100 Maryland Avenue in Rockville. For more information, visit the Civic Fed’s website.